Disney covering up Star Wars: Last Jedi's suckyness? Is Disney covering up Last Jedi's suckyness? Critical rating for Star Wars: Last Jedi have come in well but fans are hating the film. What is the deal? Is it possible that Disney is paying off critics to turn in positive reviews for the film. That conspiratiorital tone sounds nuts but many on Twitter and Facebook are accusing Disney of doing just that. There is actually a fair amount of evidence to point toward a cover up of sorts. Rotten Tomatoes show the conspiracy the clearest. Currently, the critics have given the film a stellar 93% rating, while the audience score is a lousy 55%. This is very unique because for most popular geek films the critical rating tend to be far lower than the audience scores. Film critics tend to get snobby and decry generic plot lines of the 18th super hero film they have been forced to watch by the pedestrian rabble. Looked at in this light the high score of Star Wars: The Last Jedi seems very odd. After recieving this barrage of negative reviews from the audience the major critics began the cover up. They began releasing a series of articles claiming that the film's low audience score was due to a 4chan group that voted........4 times! They also began questioning labeling fans who did not like the film as fanatics, or as some crazed and highly intolerant group of fans that want their story told their way. These fans are like the villain in Misery, insanely seeking the end they want and unable to cope withnot being able to get their way. These defensive articles point out that the Cinema Score for Last Jedi that randomly interviews people who leave the theater gives the film an A. Thus seeking to draw a further question of the viability of the Rotten Tomato scores. While some of these articles do make interesting points it is bizarre to see the critics jump out into the fray like this to defend a film. Bizarrely, even if they make good points the level and organization at which these articles are coming out makes them feel like an astroturfing psyops tactic. Astroturfing is where a political organization releases a multitude of opinion pieces in the media with one point of view from multiple different names even though they tend to all be written by the same group. This leads people to think that their are many people who think x, when infact their might be dramatically less. Disney is now the biggest dog in town to say it more accurately. Disney is the Big Dog, that just ate the other Big Dog. If you are a film critic you may not be advised to make Disney angry as they now have consoldiated power in a dramatic fashion. Even more meaningful here is the fact that Star Wars is Gold egg laying Goose of the company. Of all the films for a critic to go after this one may draw the most ire. This is entirely circumstancial evidence but it does paint the environment that critics live in and certainly shows some motivation they have for giving the film a pass. The politics for cinema reviewers is leans to the left. I don't think that surprises anyone it just is so. There is nothing new about this, in general most film and theater buffs throughout history lean left. We live in an interesting time though were politics are heavily divided and leaking into how people judge .....EVERYTHING. Multiple reviewers pointed toward the diverse cast of Star Wars as a plus, other reviewers heralded the film for showing women in power and stopping the overly aggressive man splaining males. Many left wing reviewers also narrowly paint the film as an analogy between Trump followers (First Order) and the Resistance (Progressives). The politics seen in a science fiction fantasy action adventure may not in fact be intentional but to the reviewer it gives them a chance to praise values they like and therefore they give it an A. While judging film solely based off its politics seems bizarre that is the weird world we live in today, where the merits of everything end up being tethered back to what political team one roots for. If the film had its story tweaked to have the First Order be made up of hidden cells of Storm Trooper terrorists who had infilitrated the New Republic through its open border policy but kept every other aspect the critics would arrive at a dramatically different rating of the film. Who are you? That is the question that will really determine if you like this film or hate it. I don't think there was actual conspiracy here on Disney's part. 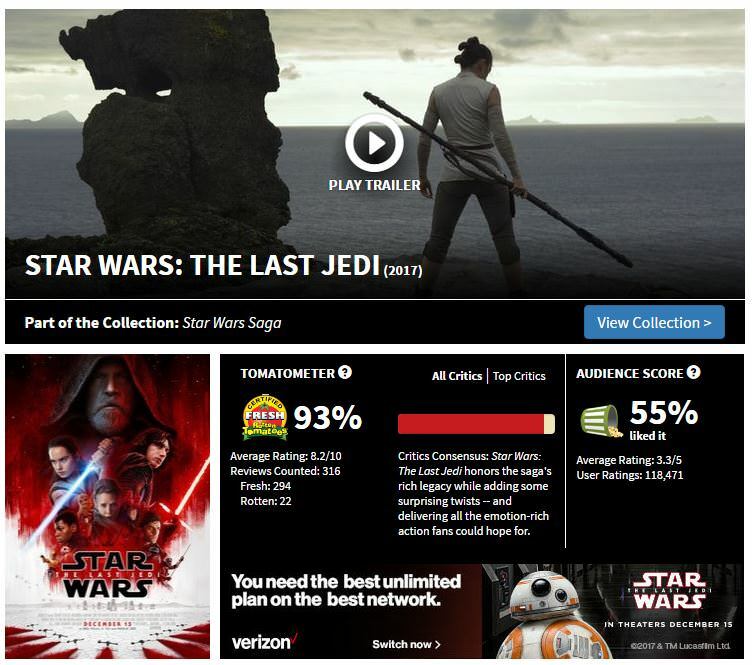 I think it just shows the difference in views between Star Wars fans and the film critics. I am amazed at how many critics say things like I just watched Star Wars the first time a year ago, etc which is a dramatically different place from a Star Wars fan who watched all the films 30 years and has read hundreds of books, comics and video games related to that universe. The difference in perspective there is huge, and sometimes it might align but here it definitely did not. Star Wars the Last Jedi is a film that canonizes one of the biggest let downs in any fandom's history. People who discuss the Snoke, and Rey aspects of the film are dramatically missing the boat on why this film is divisive. It is divisive due to its use of Luke Skywalker. While there are many characters in the Star Wars universe the first 6 films, and 95% of its support material is the story of Luke Skywalker. The first three films are the beginning of the heroes journey and we really only see Luke the Jedi in the film Return of the Jedi. Before this he is more less a good pilot, with limited training in the force. For many years fans dreamed of a new Star Wars film that show what Luke did after Return of the Jedi. There is a massive amount of books and comics that take on this period. These books show a Luke is continually growing in his Force powers and becomes a master Jedi. When new Star Wars movies were announced many fans were extremely disappointed when they were told they would be prequels. Fans wanted to see Master Jedi Luke. They moved on, somewhat but all of the reviews of those films were tainted by the want of the fandom to see Luke. When the Force Awakens came out the film was praised in part because its subplot of seeking out Luke is an echo of that of the fans. While all Star Wars fans were disappointed by the extremely limited role of Luke in Force Awakens they were also excited at where it left off. With the next film they would finally get what they had waited 30 years to see. 30 years is a hell of a build up to see anything. The Last Jedi came out and those fans expectations were crushed. Everything else in the film literally does not matter, to those old fans the Last Jedi is the worst film of all time. That is actually how I see this movie. I hate this movie more than any movie I have ever seen. I think its worse than (insert bad movie) here. It was a long boring, and I what I waited for 30 years for was not there at all. The climatic battles might as well have been fought by paper dolls. The twists heralded by critics I thought were inanely stupid and disjointed. That said I will admit to being trapped in the tunnel focus of my Star Wars fans expectations. My daughters liked the film, my wife liked the film. If you took their reviews they would say it was an A or a B and I would give it an F. I don't know if I can seperate myself from my expectations to give this film a good non biased review. I think this film has a dual nature to it, where it will be appreciated by a new generation of fans, and hated by the fans that grew up on the originals. I see very little inbetween here. Tha insight is likely more meaningful than all the reviews and algorithms in the world. To that end, the critics were not wrong, or bought off, but the fans are also not crazy fanatics. Both are simply watching the same movie from a dramatically different lens. New fans are seeing the rise of a new hero, where as old fans see a humiliating let down to their old hero. I do have one question for Disney though. Will this film create enough new fans to make up for the ones you just lost? While my wife and daughters liked the film they went because of me. I have no such impetus to see the next film. I am as indifferent to the next film as a fart in a burrito restaurant. This film was a daring gamble, but this time the house may lose. Star Wars - Alpha 1 Hub of all things Star Wars related!